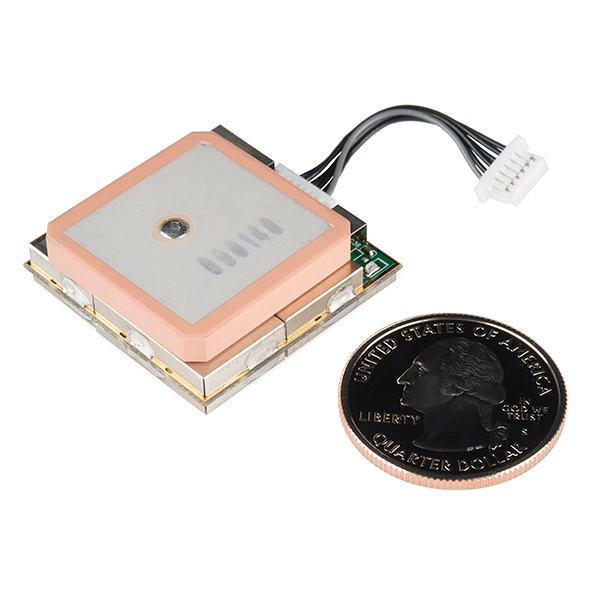 The EM-506 GPS receiver from USGlobalSat based on the spectacular SiRF StarIII chipset. This complete module is built upon the same technology as the ET-301, but includes on-board voltage regulation, LED status indicator, battery backed RAM, and a built-in patch antenna! 6-pin interface cable included. 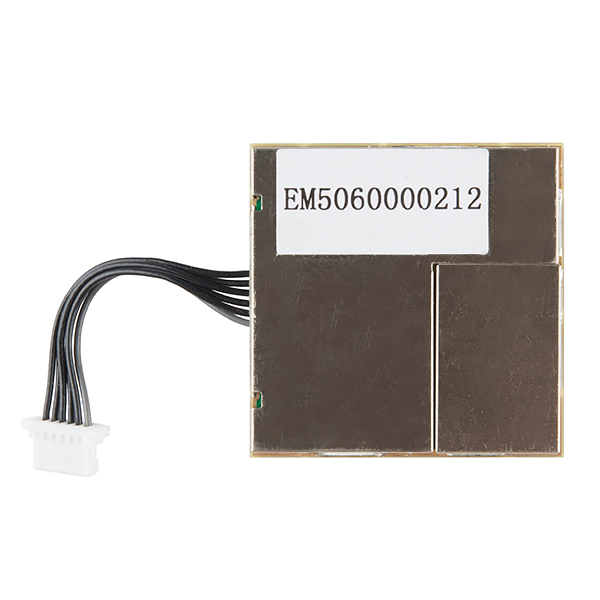 This EM-506 GPS module is powered by SiRF Star IV, it can provide you with superior sensitivity and performance even in urban canyon and dense foliage environment. With SiRF CGEE (Client Generated Extended Ephemeris) technology, it predicts satellite positions for up to 3 days and delivers CGEE-start time of less than 15 seconds under most conditions, without any network assistance. 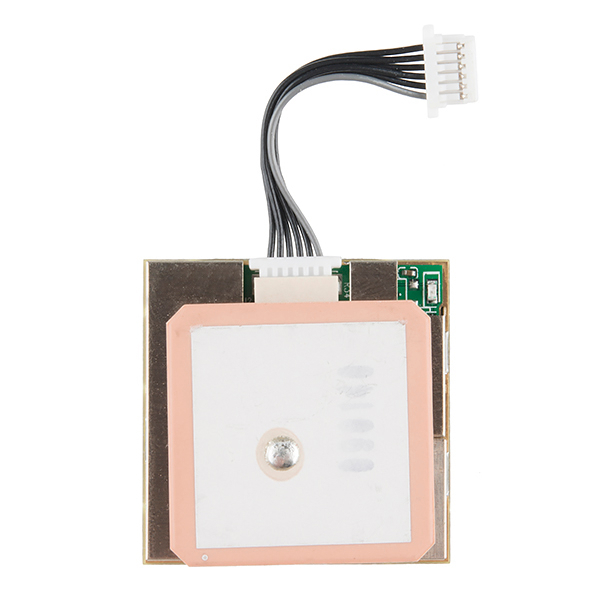 Not sure which GPS module is right for you? Check out our GPS Buying Guide! The data sheet for the EM-506 is a bit foggy on what the directive pin does. USGlobalsat only says "This pin indicates the GPS states." but our testing indicates that it outputs a 1 second high, one second low pulse. (High level is 3.25 volts and the low level is 0.75 volts.) The directive pin appears to be a 1PPS pin that's active once you achieve lock with GPS satellites. The GPS receiver uses a serial UART. Page 3 of the datasheet shows the pinouts and specs. For an example hookup with an Arduino, click here. Try using a blank sketch so that the Atmega328P does not interefere with the serial from the GPS just like the "Serial Debugging: Arduino-Compatible board" example. Don't have an FTDI to test but you do have an Arduino? This image shows how to hook up your GPS Module with an Arduino to test if it is working or not. Solder the outside shield to another PCB with mounting holes. Glue it to some plexiglass that I can mount to my frame. I hace a GPS EM 506 sparkfun shield. I would like to know how I can change the default Digital pins for Serial communication. And also de baud rate. Please could you help me? Thank you. What kind of cable is that? I can't for the life of me figure out how to break those pins out into regular wires. From the datasheet I gather it hooks up to serial tx / rx ports which is cool (I'm using a raspberry pi so that's covered). But plugging it in is proving to be an embarrassing challenge. If the dynamic limits of this GPS receiver are exceeded (4g, 20 m/s^3) will it automatically reset and be able to get a fix again once it is back within the limits? If not can it be commanded to reset? Did a unplug-plug replacement for a 406A in a current application, same SparkFun GPS shield, same code, etc. Once I cycled the power switch on the shield, the 506 worked a treat. Newbie question: Can the EM-506 communicate with an Edison through one of the Edison blocks? Still learning what the interfaces are and trying to figure out compatibility. If so, can someone provide a brief description of how the 506 wires connect to an Edison block? Or do I need some kind of additional hardware between the 506 and the Edison blocks? I am using the EM-406 with the GPS Arduino shield. Will this be a drop in replacement? It should be similar enough. There might be minor differences, but it should work out fine. Will this GPS work at 120,000 Ft? Nope, page 3 of the datasheet lists the maximum altitude as 18,000 meters. Anyone knows if this GPS come from factory with the SBAS enabled?. And why the Rx pin of the second UART did not have pin to send RTCM-104 data to the unit?. I want to implement this module in a project and I am looking to a module with DGPS enabled and I did not found any. Does this module put out PPS like its predecessor? It has something called "Directive" but I have no idea what that is. Does the unit have to be placed facing the sky, with nothing covering it? Would it still work if, say, there was a sheet of metal over it? Thank you. Wondering the PPS (PIN # 6 of EM 406) is connected or left open in GPS-10710? if not connected how can the issue can be solved?? Anyone flown this on a high altitude balloon yet, or have confirmation it works over 60K ft? The datasheet lists the maximum altitude as 18km (~60,000 ft). I see in the revisions that the 1PPS signal was changed to "directive". Is the "directive" signal also timing quality, or is there a way get the 1pps back? Is this not a 3.3v part like most GPS parts or am I reading the sheet wrong? Does that complicate it's use with battery projects? Looks like a great part aside from that concern. The I/O levels are 3.3V but the Supply voltage (Vin) is 5V. To complicate the things even more, the sparkfun GPS shield has NO logic level converter for its RX. It's connected directly to arduino pins. You may have to cut a trace. Ran this module up on my coffee table in the lounge, and despite being inside a double brick building, got a reliable fix remarkably quickly. NMEA data is pumping out as expected, and the provided interconnect cable had me connected up to my dev board really quickly. ....just download the "TingGps" library, it will make development very easy. The little connector is impossible to solder, you'll just end up stripping the cable (which isn't easy); However the unit it's self is fantastic, accuracy to around three meters. Great accuracy. Decent fix time. This thing has great accuracy. After the initial fix it could place my location on a map with pinpoint accuracy. The fix time is quick if you are under open sky. In a building it is a bit slower. I've only done some rudimentary testing so far, but it seems to work fairly accurately. The GPS appears to lock onto the satellites quickly, usually within a few seconds. Sometimes longer, but it could depend on the cloud cover. I didnât pay attention to that. I entered the reported position into Google maps. I was sitting near a perimeter wall of my house, and Google pinned a location just outside of my house, about 10 ft away based on the outline of the shown houses. Iâm not sure how accurate the Google maps located the houses, but the shown location was good enough for me at the time. I had the GPS plugged into a Sparkfun CAN-BUS shield piggy backed on the Arduino Uno. I took the setup for a ride in my car having the Uno display the GPS speed on a LCD display. The GPS speed updated quickly tracking the car speed. Iâm happy with the GPS unit thus far. I got this receiver for hobby purposes and wound up building a small decoder using the Uno. The reception is pretty good. It will receive just fine indoors with the curtains open. If there was anything else that I might wish for it would be to add an optional external antenna. This is the first GPS module I've worked with. It works as advertised, including very fast time to fix. I'm using it as part of a clock, so in a perfect world, I would want a unit that had a 1PPS output. As far as I can tell Sparkfun sells units that have 1PPS, and units that have integral antennas, but not units that have both. Does anybody know otherwise? The module worked as expected right out of the box. Receive sensitivity seems to be quite good, but I'm not convinced that the Time To First Fix is as good as advertised. That, combined with the absence of a 1PPS output, is my reason for a four-star rating. Before I purchased, I inquired if it was suitable as a replacement for the redundant EM-406 and was told it was. However information about software changes like Baud rate will be required before it will work as a change over replacement so it was not a straight forward replacement as expected. We have not completed the software changes to make it work yet so I hope I am not premature providing this requested feed back. Relevant info at the time of inquiry before my purchase would have been appreciated as I had not booked my software writer to alter code. Hi, Sorry about the baud mismatch. Other than that, this module has the same pin out (minus the 1pps which has been replaced with a Directive pin that outputs GPS states.) It has the same power parameters 4.5~6.5V. It is using the updated SiRF Star IV as compared to the 406's SiRF Star III. The accuracy and precision is great. GPS locks to satellite signal in just a few secs. The signal is great even indoors. ( Although you might need to take it outside for initial signal lock ). The setup was very easy and quick. Quick negative point : GPS documentation could be better. The baud rate of the GPS is not specified on the datasheet and one has to shoot in the dark with guesses. GPS datasheet could be much much better. We have a number of these units working well in our equipment. Very accurate and easy to integrate. I had an RS232 shifter which I could use to connect it to my laptop. It output data as expected. It logged on to the satellites quickly with no need to initialize. I wanted to preset the baud rate and output messages. I had some Java code to read and write to a port. I added a function to append the checksum to the command sentence. I could then turn off some of the output sentences but that was not persistent over a power cycle. But when I set the baud rate, it made the output sentence selection permanent as well. So all is well.. Dave Heffler Lunenburg, N.S. Canda.